Marquette Catholic’s Garrett Weiner (left) looks back to the Explorers dugout after hitting a double last week at Mascoutah. 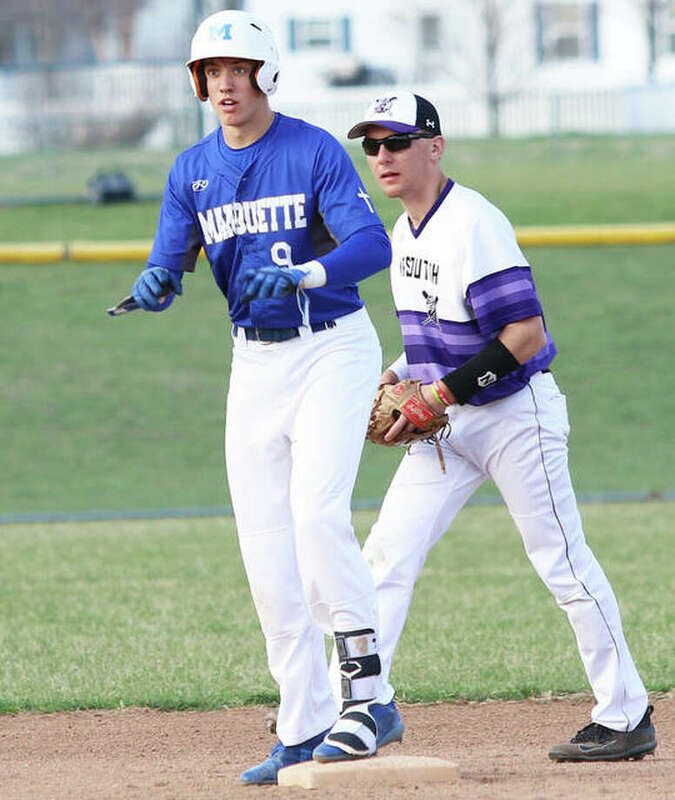 Weiner had two hits Tuesday to help Marquette rally for a 6-5 10-inning win over Civic Memorial in Alton. It took 16 strikeouts in a two-hit complete-game from Bryan Hudson in April 2015 for the Alton Redbirds to beat the O’Fallon Panthers. The Redbirds had not beaten the Panthers since that Hudson shutout at Moore Park in Alton. O’Fallon had won the last eight Southwestern Conference baseball matchups with Alton, but the Redbirds drew even on Riley Phillips’ sixth-inning home run and beat the Panthers 3-2 on Jackson Brooks’ RBI single in the eighth Tuesday at Alton High in Godfrey. Alton is 6-7 and 3-0 in the SWC. O’Fallon is 8-5 and 1-2 in the league. With the SWC’s newly implemented format of weekly Tuesday-Thursday dates with the same team, the Redbirds and Panthers get an immediate rematch Wednesday in O’Fallon. That game was moved up a day to avoid rain forecast for Thursday. Alton left-hander Michael Reeder threw five scoreless innings before O’Fallon took 2-1 lead on Wes Collins’ two-run homer in the sixth. The Redbirds answered in the bottom of the inning with Phillips’ leadoff homer to tie it. Reeder left after six innings, allowing two runs on three hits, four walks and four strikeouts. Adam Stilts struck out three, hit one and walked no one in two hitless innings to earn the win in relief. Alton went right to work in the eighth, with Dylan Lahue getting hit by a pitch and Phillips drawing a walk before Jackson drove a 2-0 pitch to right field to send home Lahue with the game winner and trigger a Redbirds’ walk-off celebration. Phillips, who also doubled, combined with Brooks in the Nos. 3-4 slot in the order to account for five of the Redbirds’ six hits. Brooks had three hits and drove in two runs. O’Fallon starter Ben Koenig departed after seven innings and Logan Lowery took the loss after not retiring a Redbird in the eighth.